With Deep Space Nine – again operating as Terok Nor – lost to The Dominion-Cardassian alliance, Season Six opens with an audacious, grim story arc spanning six episodes that progresses the series to new levels. From this point onward, the show’s tone further darkens as The Dominion conflict casts an enduring shadow. Even hopes of euphoria are ultimately dashed when the marriage of Worf and Jadzia ends in tragedy. Character evolution is discernible, especially from DS9’s growing network of supporting characters. In particular, Dukat’s character sees new levels of complexity when his long-lost daughter, whom he almost murdered, moves onto the station. Bashir’s career is put in jeopardy when his origins are revealed, while Kira discovers an unsettling truth to her mother’s disappearance. If there is one moment of optimism during season six, it comes from cupid’s arrow finally striking Odo and Kira. As is common with Deep Space Nine, the season conclusion with a major cliffhanger. This time, it’s not the station lost, but the wormhole and one of DS9’s most beloved characters. Despite its gloomy nature, Season 6 is one of Deep Space Nine’s best all-around seasons. The displaced DS9 crew infiltrate Dominion space with a commandeered Jem'Hadar ship to cut off their ketracel-white supply. After crash-landing, the crew of the commandeered Jem'Hadar ship are stranded, along with a Jem'Hadar group and their Vorta. Worf is reunited with his son, now a Klingon officer, while Dukat's relationship improves with his newly discovered daughter, Ziyal. 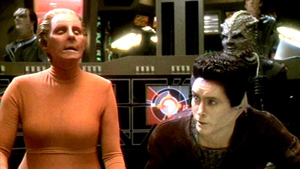 The Female Changeling arrives on DS9 while lives adjust to the Dominion occupation of DS9. As the Dominion Occupation of DS9 continues, Sisko plans out a strategy to retake the station. With the Dominion only days from removing the minefield, the battle for DS9 escalades with tragedy. The station celebrates Worf and Jadzia's long-awaited wedding. Kira is stunned when a man believed to be her former lover, Vedek Bareil, suddenly returns from the grave. Dr. Bashir offers to help a fellow group of genetically-engineered individuals better integrate into society. Quark and Rom organize a group of Ferengi missionaries to rescue Moogie, their mother, from the Dominion. Sisko and the recently captured Dukat, distraught from losing everything, become stranded together on an isolated planet. 6-12: Who Mourns for Morn? On the news of Morn’s death, numerous old acquaintances arrive at DS9 in search of his secret fortune. Through a vision from the Prophets, Sisko has visions of living in 1950s Earth as a struggling writer. An accident physically shrinks a runabout while the Defiant is overtaken by the Dominion. Chief O’Brien is sent to infiltrate the Orion Syndicate, an organized criminal group. When Jadzia is mortally wounded, Worf must make the difficult decision to save his wife or the mission. Major Kira uses the Orb of Time to travel back and investigate Dukat’s claim that her mother was his lover. Section 31, the Federation’s secret autonomous intelligence agency, investigates Dr. Bashir as a possible Dominion spy. Sisko struggles with ethics as he works with Garak to persuade the Romulans against allegiance with the Dominion. Deep Space Nine is center of an epic battle between the Prophets and Pah-wraiths, with Kira and Jake both chosen as their corporeal vessels. When their runabout is attacked by Jem’Hadar, Jake and Nog are rescued by Red Squad, an elite group of Starfleet cadets. During a visit from the Zek and Ishka, Quark impersonates a female to prevent Brunt from becoming Grand Nagus. After Chief O’Brien and Kieko lose their daughter in an obscure accident, she returns as a drastically aged adult woman. While en route to rescue a stranded Starfleet officer, members of the Defiant crew communicate with her over subspace. When a rejuvenated Dukat returns to DS9 with intentions to harm the Prophets, a beloved crewmember’s life comes to a tragic end. 1-07: What Are Little Girls Made Of?